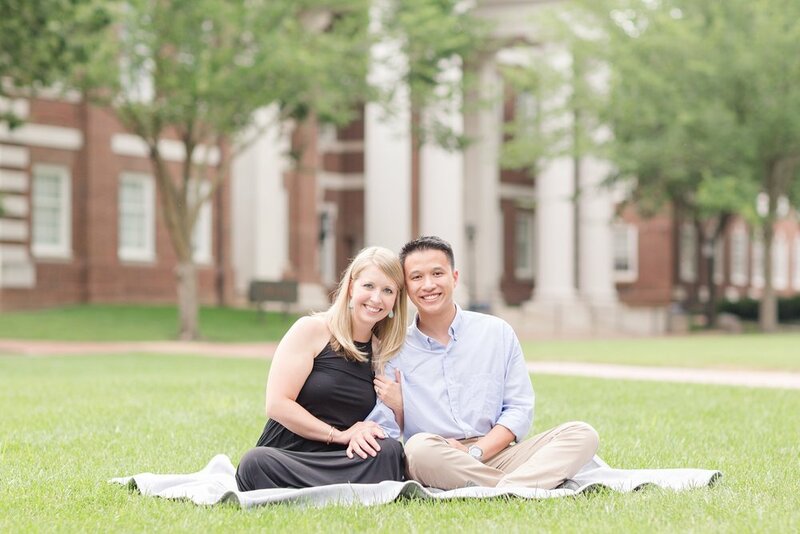 Kelvin and Whitney are two physical therapists who fell in love and are getting married next fall! 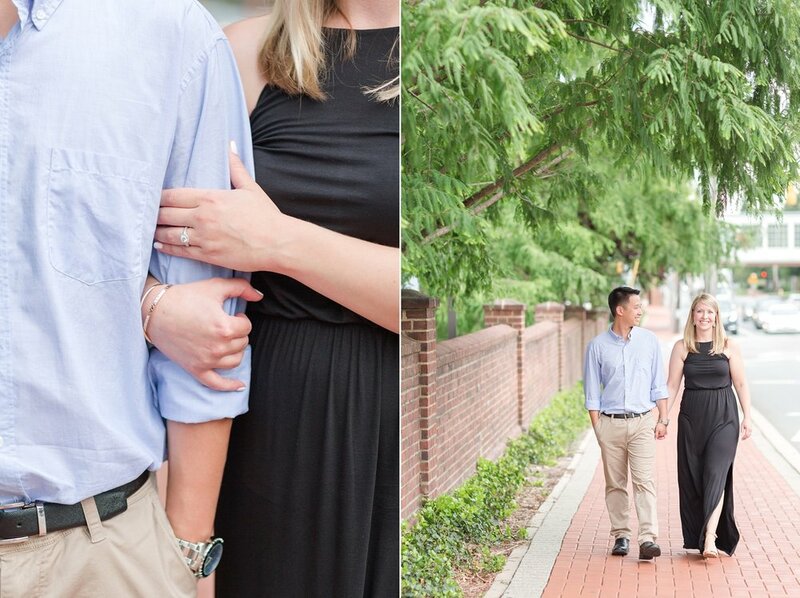 We did their engagement session around University of Delaware because Kelvin graduated from there for undergrad. It is a beautiful campus with lots of fun spots to take pictures! Here is their love story from Whitney's perspective! Kelvin and I met in graduate school in Maryland. First semester, we really weren't even friends. During our second semester, we started studying together pretty much every day (neuroscience was kicking our butts!) We became good friends that semester, and realized we had A LOT in common...we even had the same favorite donut and cereal. Without even knowing what was happening...we were falling for each other! Regardless, I mildly panicked when he first asked me out...even though we were pretty much already on a date when he asked! Our first dates were easy, because we were already such good friends! He told me he loved me for the first time at the library (nerdalert - no shame!) We graduated in September 2016, and are both now practicing physical therapists in New Jersey. Kelvin proposed in one of my most favorite places in the world, my parents house. We had travelled home to Maryland for the weekend the celebrate my birthday. My mom treated my sister and me to a girls day that day, including manicures (thank goodness!) and high tea, for my birthday. When we got home, some of my family was hanging around the house (like normal), before we met my aunt and uncle for dinner. Side note: I love snail mail and look forward to the birthday cards I receive in the mail each year. When we got home from the girls day, I asked my mom to stop at the mailbox at the end of our driveway so I could get the mail, before we drove up to the house...and she said no! She told me I needed to walk off my lunch, so I needed walk down the driveway and get the mail on foot. Little did I know, she was looking for a quick excuse to prevent me from getting to the mailbox yet. Of course, I was mildly annoyed and kelvin "ever so sweetly", said he would walk to the mailbox with me. When we got there, he got the mail out and so so slowly flipped through the mail. In the pile was a letter addressed to me from him. I was so excited, thinking, "oh my gosh he sent my birthday card through the mail because he knows I love snail mail! I kept trying to open it andhe kept saying, just wait until we get up to the house. I started to open it and he was quite literally, pushing me into my parents backyard. As I opened the birthday card and read the sweet words inside, tears filled my eyes but I still hadn't comprehended what was happening. The last line read: "I just have one question for you..." I looked up, and Kelvin was getting down on one knee and asking me to marry him. CUE THE SOB FEST! I, of course, asked if he was joking...because I was so caught off guard. Next thing I knew, one of my best friends popped out of the bushes with her camera and my family was on our back porch cheering! The center stone of my ring belonged to my great grandmother, and Kelvin had it placed in new setting, after my dad gave it to him when he asked for my dad's blessing to marry me. My sister owns the original setting of diamonds, now with a new sapphire center stone...so we both have a piece of this precious heirloom! Enjoy these images from Whitney and Kelvin's engagement session! They were pracitcing dancing and couldn't stop laughing, it was sweet! Gorgeous ring. Great job Kelvin! You two are adorable!! Can't wait for your wedding next fall! In case you missed it, check out Matt & Kristin's dreamy wedding at Whitehall Estate!